Teachers at schools and daycares in Floyd County are eligible for School Collection Accounts. School Collection cards are kept at the library and used to check out classroom materials. You may request a collection on a certain theme or visit the library to pick our your own collection. There are no overdue fees on School Collection Accounts and collections can be delivered to public schools via the school courier service. To apply for a School Collection Account or request a school collection, please click here! Children’s librarians are happy to visit your class with a storytime or booktalks. Programs can be customized to fit your needs and availability. 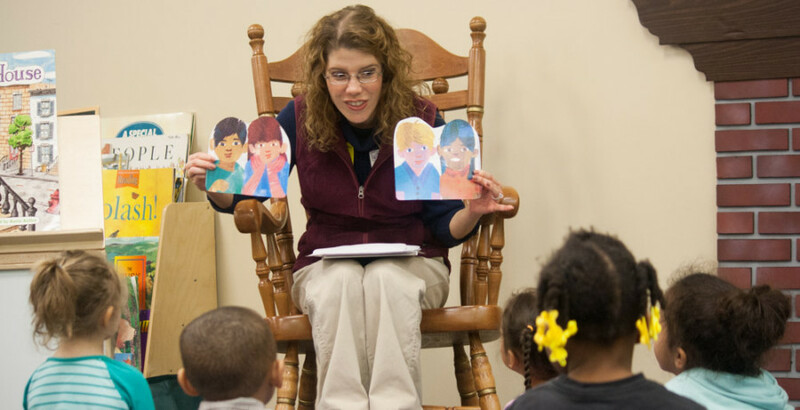 Storytimes (recommended for Pre-K through 2nd grade) generally last 20-30 minutes and include stories, songs, rhymes, and interactive activities. Booktalks (recommended for 2nd grade and up) are short “previews” of great books we have at the library, similar to the previews you’d see at the movie theater. Booktalk programs can range from 15-60 minutes, depending on your classroom availability, and will be customized to fit your group’s age range and interests. Please contact the Children’s Room to book a librarian to visit your facility. All programs are free of charge. We are happy to welcome classes to the library for field trips. We can offer a storytime (Pre-K through 3rd grade), booktalks (3rd-5th grade), and/or a library tour (grades K and up). Field trips will be booked on a first-come, first-served basis depending on availability of our meeting rooms and staff. Please contact the Children’s Room to check on availability or to book a field trip. All programs are free of charge. For more information or to participate in any of these services, please contact the Children’s Room by phone at (812) 949-3528 or by email at childrens@nafclibrary.org.